Lake Texoma elevation is 611.90 over 5 feet low and our water tempter is at 88 degrees. The stripers on Lake Texoma continue to work the surface chasing shad but from what I've seen this past week the size these topwater fish are tending to be smaller. 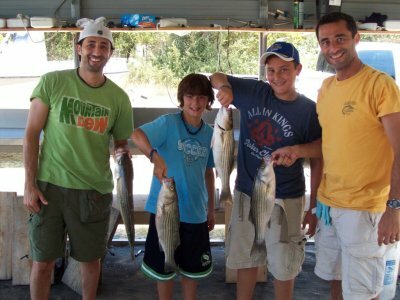 As far as the slab runs they are steadily producing good fish daily. The stripers are running the ledges related to the flats in the 30-40 feet of water. Some mornings the run starts right away and other mornings it has taken an hour or two before they wake up and really start to make their run. Catching stripers on slabs has been so good I have pretty much abandoned looking for the schooling topwater bite unless we just come across them. I'm still using the TNT 180 1/12-2 oz in the chartreuse and white but that's just my preference. Were still using the burn method, simply drop the slab to the bottom and reel as fast as you can. On some of the slower days jigging the slab slowly off the lake bottom has resulted in some good sized stripers. 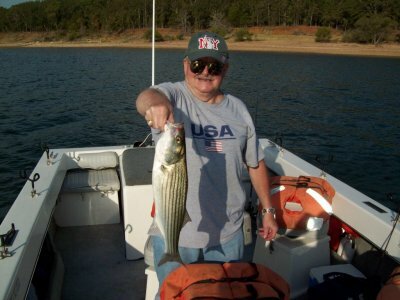 If you can handle the warmer mornings and would like to experience some fantastic Lake Texoma striper fishing, now is an excellent time to get out and try some Lake Texoma slab fishing. Watch the boat traffic if you go out on the weekends as their are a lot of chasing the stripers. If you find yourself in the middle of this mess, be very careful and courteous. 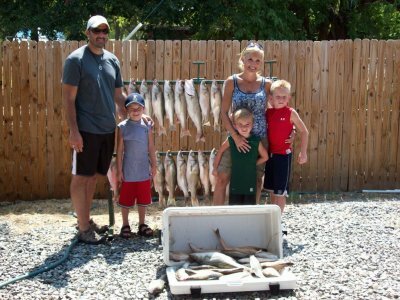 Be sure you have all your safety equipment and a current Lake Texoma fishing license and get ready for some fun time on Lake Texoma.